It’s well-known that Buddha was at a later phase included into the Hindu pantheon as an avatar of Vishnu. This myth is frequently invoked by the modern Hindus to encompass Buddhism as a part of Hinduism. What is not well known is the status of Vishnu as a deity within Buddhism per se. In the previous article, we had seen the status of Shiva in Buddhism, and now we analyze in detail the status of Vishnu vis-à-vis Buddhism. Compared to Shiva who has relatively more references in the Mahayana Buddhist sutras and the numerous Vajrayana Tantras (where he appears as Rudra, to be always subdued by the wrathful Buddhist deities at the end), references to Vishnu are quite less. This perhaps may be due to the fact that, the later Buddhists were in a position to directly interact more with the Shaivaites than the Vaishnaivites. As already referred in the “Shiva in Buddhism” article, Theravada Buddhism is quite orthodox in admitting deities into its fold. Rather than integrating the deities directly into the religion, it tends to keep the deities in the periphery as local deities to be worshipped for favor or as Dharmapālas (Dharma Protectors). In Sri Lankan Theravada, Vishnu is worshipped as “Upulvan” (Pali. Uppala-Vaṇṇa). The equivalent Sanskrit title is “Utpala-Varṇa” (Blue-Lotus-Colored). Vishnu is frequently depicted as blue colored (Blue being a euphemism for the original Black color of the deity). Vishnu as Upulvan is the Kshetra-Pāla (Protector of the Land) of Sri Lanka. Buddha before his parinirvana seems to have seen the island of Sri Lanka as the future place where his shāsana (law) will flourish. Therefore, he orders Indra for its protection. Indra then entrusts the protection of the island to Vishnu (Incidentally, Vishnu originally seems to have been subordinate to Indra in the Vedas. This seems to preserve the early status of Vishnu as a sub-ordinate deity). During the early days of early days of formation, Buddhism didn’t have many deities to deal with. The Predominant deities of those times were Indra and Brahma. In the Tripitaka, all these deties are shown completely subservient to the Buddha. They are potrayed as waiting and attending upon the Buddha, and as receiving many teaching from the Buddha himself. At one instance, it is even said the Maha-Brahma himself had advised a Brahmin who had reached the heavenly Brahma-realm, to clear his doubts with the Buddha instead of him ! As Buddhism evolved over times, it had to face the new Puranic Brahmanism with the influence of the Vishnu, Shiva and other deities rising over time, compared to the other Vedic deities who were now often reduced to a tutelary status. Puranic Brahmanism was highly syncretic assimilating everything that came in its way. Even Buddha himself was assimilated to the Brahmanical Pantheon as one of the Avatar-s of Vishnu. At the same time, Buddhism had also attempted in assimilation of the Brahmanical Deities into its fold. However, this part is not that much widely known. Buddhism in its Theravada version was more orthodox, and didn’t officially expand beyond the already assimilated Indra, Brahma and other early deities. [Though Sri Lankan Theravada assimilated Vishnu as a Kshetra Pāla – Protector of the Land, but that was outside the Theravada Canon]. However, Mahayana Buddhism was highly assimilative in nature. The framework of Mahayana easily enabled the direct import of deities into its fold. When Mahayana was faced with Shaivism and Vaishnavism, it also had played its part of trying to assimilate Shiva and Vishnu in Mahayana. The śramanic Traditions namely Buddhism & Jainism had a great following in Tamil Nadu until the Early centuries of the Common Era. The early rivalry was chiefly between Buddhism and Jainism. However, the dominance of Buddhism gradually declined [Due to various reasons which needs to be discussed seperately] and Jainism gained a upper hand in Tamil Nadu. Jainism dominated the religious scene until 7-8th Century CE, with its main rival being the Vedic Shaivaite religion. As a dominant religion of that time Jainism had a great influence on Tamil Shaivism. In Tamil Shaivaite world, 63 nāyaṉmārs, are a set of 63 Legendary saints who are widely venerated. The 63 Nayanmars supposedly lived in a Time where the Shramanic Jaina religion was very popular. Traditionally the Nayanmars are said to be one of the reason for the downfall of the Jaina Religion and popularizing the Vedic Shaivism among the public. The Tamil Epic “Periya Purāṇam” is a work which describes the legends of the 63 Tamil Shaivaite saints. The Epic was written by Sekkizhar around 12th Century CE. The Background story for the composition of this Epic is interesting. The Chola King Kulōttuṅka was very fond of the Jaina Epic called “Sivaka-chintamani (Sanskrit: Jīvaka Cintāmaṇi)”. It describes the legend of the Jaina king Jivaka and explains the Jaina philosophy along with the narration. Sṛṣṭikartā Lokeśvara, one of the 108 forms of Avalokiteshvara, is perhaps the most interesting form of Avalokiteshvara, apart from Hari Hari Hari Vahana Lokeshvara. Here Avalokiteshvara assumes the form of Srishtikarta (i.e Creator) emanating all the Vedic gods from his body, for the benefit of all the beings. According to Lokesh Chandra, Bhattacharya misread sṛṣṭikartā as sṛṣṭikāntā (which actually reads something awkward like Creation-lovely or something similar, that too in the feminine !) Lokeshvara in his Book “Indian Buddhist Iconography”. During the days when E-Sangha, was up and active, there was a thread on Hari Hari Hari Vahana Lokeshara (No.. The Name is not a Typo.. 🙂 ). 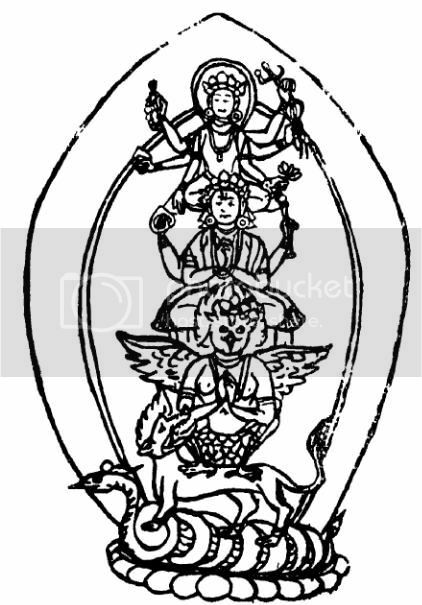 I had come across this Interesting form of Avalokitesvhara from the book “Indian Buddhist Iconography”. So I started a thread on Hari-Hari-Hari-Vahana Lokeshvara, where lot of Information had been gathered about this peculiar form of Avalokiteshvara (mostly by me). Given that E-Sangha is down, I thought I could replicate the information here. Hari Hari Hari Vahana Lokeshvara is one of the 108 forms of Avalokitesvara.